We were racking our brains with what to do with a two week supply of rhubarb delivered recently by our box scheme. They were slowing turning a pale grey when today inspiration hit. 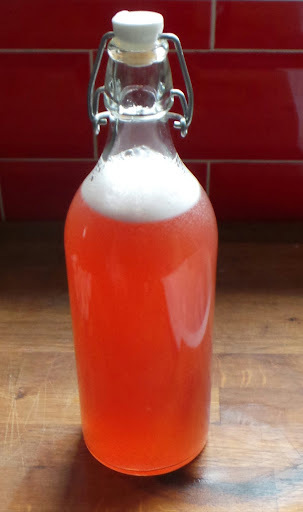 Rhubarb cordial… and what is more is that it is remarkably easy to make. Basically the method is pretty simple. Simply chop the rhubarb and throw it in a big pan and cover with water. Let the rhubarb simmer for about 30 minutes and leave to cool. Once cool enough to handle take a sheet of muslin, or in our case a bit of old bed sheet, and strain the rhubarb mixture through it into a large bowl. This stage requires you to hand the muslin and leave the mixture to filter through over about an hour. Next, take the filtered liquor and put it back into the pan. Add the sugar and lemon juice and heat slowly until the sugar is dissolved. Do not allow the mixture to boil. While your mix is on the heat take the time to sterilise a litre bottle. We simply heated a glass bottle with a swing top lid in the oven, but you could equally make up a solution of Milton and soak a plastic bottle for 20 minutes or so. If you choose to heat a glass bottle when you have filled the bottle allow the finished cordial to cool upside down in the bottle. This helps sterilise the lid. If you want to store the cordial for some time you could add a 55g of citric acid and half the amount of lemon juice. The cordial should dilute to about 1/3 and is fantastic with sparkling water! Sorry, but to be candid, this venture appears to be more about oddball country fayre and recipes than any serious attempt to identify and promote British products. It’s probably a great recipe but why here? Thanks for your feedback Graham. Part of our project is to live seasonally. It is relevant to our project that we show the ways in which we use this seasonal produce. Additionally, we try to provide recipes where we feel that we have had to be innovative to get around the constraints of surviving off a lack on imported goods. So for instance using Ginger beer to flavour food because ginger is not commercially available to us and the same with finding British made lemon substitutes. We have a broad readership and we feel that the best way to engage a larger number of people is to make our blogs accessible in this way rather than become a product review site. I understand that our posts can be quite eclectic in content because of this and we thank you for your feedback. I tried putting a swing back lid bottle in the oven once only to have it melt! I was actually looking for a cordial recipe so thanks. I think Graeme is just being pedantic. I like hearing about your exploits! I think you should buy spices, tea and cocoa thoughbecause they have always been imported. Good luck with the fayre. Should had said, you need to removed the lid before you put the bottle in the oven. I know its silly but please edit your spelling of recipe! LOVE this recipe and have copied a link on to my facebook page (with credit to you of course). Makes a lovely change from rhubarb crumble – thank you so much ! I also tried it with gin 🙂 …..I wonder if Pimms will bring out a version of this next summer ? Great idea… I am going to try that. Will let you know how we get on. This is the third time I’m making this – I love your recipe – thank you! I juice my lemons through the juicer and I think the extra lemon makes it even more lush!